Poster Print entitled 'UFO's and fighter planes in the skies over Roswell, New Mexico'. 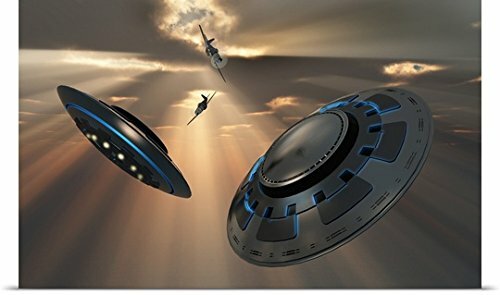 A 3D conceptual image illustrating UFO's and fighter planes in the skies over Roswell, New Mexico. In July 1947 it was reported that an extraterrestrial flying saucer had crashed at a place known as Roswell, New Mexico, USA. Conspiracy and denials have come and gone ever since. Multiple sizes available. Primary colors within this image include: Peach, Gray, Dark Navy Blue. Made in the USA. Satisfaction guaranteed. Archival-quality UV-resistant inks. Looks great in dorm rooms, kid rooms, offices, and more. Printed on high quality gloss finish paper with archival quality inks.